THE GREATEST INCENTIVES ARE OFFERED TO OUR VOLUNTEERS!!! Please use the link below to sign up for a work shift. You will need to log in with your consignor number and password to sign up for work shifts, or register to work as a volunteer. The shifts will be filled on a first-come first-served basis. Below are incentives for those who choose to work shifts during the event. Choose 4 shifts to shop at 11:00am & to shop early the 1/2 price day. Choose 3 shifts to shop at 11:00am Tuesday. Choose 2 shifts to shop at 1:00pm Tuesday. Choose 1 shift to shop at 3:00pm Tuesday. Choose 5 shifts to shop at 11:00am & to shop early the 1/2 price day. Choose 4 shifts to shop at 11:00am Tuesday. Choose 3 shifts to shop at 1:00pm Tuesday. Choose 2 shifts to shop at 3:00pm Tuesday. Choose 1 shift to shop at 5:00pm Tuesday. A $20.00 fee will be deducted from your earnings for every four hour shift not worked. Please Note: THIS FEE WILL BE DEDUCTED EVEN IF YOU SIGNED-UP BUT COULD NOT SHOP THE PRIVATE SALE. By checking the box above you are acknowledging that you have read and agree to the above worker policy. Shop before the consignor’s private sale! 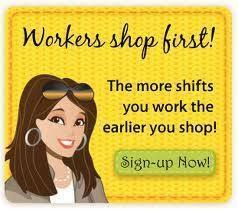 Each four-hour shift you choose, will allow you an earlier shopping time! Shop before the public sale! Each four-hour shift you choose, will allow you an earlier shopping time! Choose 5 shifts to shop at 11:00am & to shop early the 1/2 price day. By clicking “Proceed to Worker Signup” below, you agree to the above terms. Click “Proceed To Worker Signup” above to view the schedule.